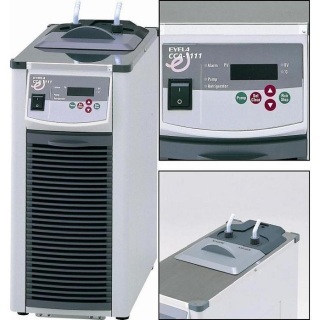 Recirculating Chiller - Oasis Scientific Inc. The CCA-1111 Recirculating Chiller operates between -20°C and 20°C, and performs exceptionally as a low temperature circulator for a condenser. It is space-saving, requiring minimum installation space. The CCA-1111 has high cooling capacity, 450W @ 10ºC in compact body. It has an easy-to-use design. The circulating nozzle direction can be changed freely, and nozzle filter can be cleaned by water. Deep nozzle tray drains dew drop before overflowing. The control panel is clear and easy to operate. The CCA-1111 is ideal for a variety of cooling requirements such as rotary evaporators, analytical instruments, industrial machines, heat exchangers, etc.